MIU Faculty of Computer Science senior student group (VAP Group) won first place and EGP 10,000 in the Connect Arabs competition organized by IBTIKAR. The project ranked first out of more than 30 other projects presented to the competition. The group was supervised by Dr. Ayman Ezzat and included Khaled Galal, Anwar Mohamed, Ahmed Mostafa and Mohamed Hesham. 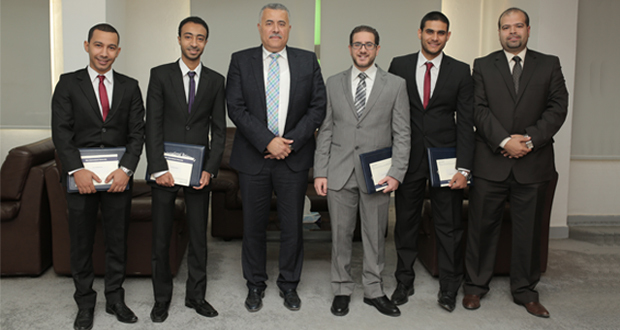 The MIU student group presented a project which aims to prevent vehicle accidents by installing two cameras on the side mirrors of the car, which detect the cars coming from the back and measure the distance between the camera and the detected cars. According to the measured distance, a green or red arrow appears on a screen installed on the dashboard which tells the drivers whether it is safe to change the lane or not. The project’s proposed solution helps drivers make safe decisions while driving. It also provides a safe way to send texts through a keyboard attached to the driving wheel that reduces the distraction of using mobile phones to send texts while driving.